Pretoria – Bridgitte Hartley’s stellar year got even better yesterday when it was announced that she had placed first in the overall ICF World Cup competition. 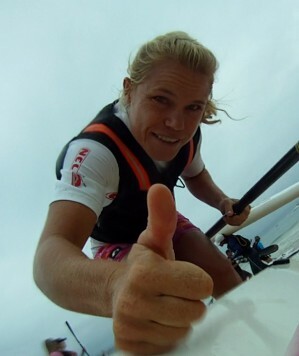 Over the course of the three international World Cup regattas, Hartley accumulated more points than any other competitor, meaning she has consistently been the world’s top performer in women’s sprint kayaking over the past two months. Hartley received the news online, and had to hold back her emotions. “I just wanted to scream and cry together, but the internet café was not the appropriate place to do this!” she said afterwards. At the beginning of the year, Hartley had set herself the lofty goal of placing in the top three at the end of the World Cup season, and she was ecstatic to have overachieved on it. The overall rankings for the World Cups only take the Olympic-distance 500m races into account, and with a gold, a bronze and a seventh place from the three regattas, Hartley finished on top of the standings, two points ahead of German icon and 5-times Olympic medalist Katrin Wagner-Augustin. Top Danish sprinter Henriette Engel-Hansen was a further eight points behind in third place. However, Hartley’s success wasn’t confined to the 500m races and her results over all distances were outstanding. The K1 star took herself to the first World Cup of the year in Racice, Czech Republic, and as the only athlete representing South Africa had to perform the dual role of administrator and competitor. The load didn’t seem to weigh too heavily on her shoulders as she won bronze medals in the K1 1000m and 500m events, and capped the weekend with gold in the 5000m race. She was joined two weeks later by the rest of the national squad as they set out for the Poznan World Cup in Poland. With more athletes taking part from around the world, and the competition even tougher, she was able to hold on to her good form to win two more bronze medals in the K1 1000m and 5000m races. Saving the best for last, Hartley was on fire for the third and final World Cup in Szeged, Hungary – the traditional home of sprint paddling. In a star-studded final of the K1 500m race, Hartley raced to the gold medal ahead of two Beijing Olympic medalists to claim the biggest win of her career. She followed that up with yet another bronze in the K1 1000m event. In less than a month, the ace South African sprinter had won 7 medals against some of the toughest competitors on the world’s water. Hartley was full of praise for her coach Nandor Almasi, as well as her sponsors. She also thanked the the National Lottery Distribution Trust Fund for their funding of the sport, and the facilities and support at the High Performance Centre in Pretoria. “Being a member of the Tuks club my little 400m pond is not adequate for good training sessions, so another ingredient was the Centurion Club at Rietvlei and the Academy Canoe Club at Roodeplaat for access to the dam and training facilities, as well as the MTK club in Hungary which was my base between the World Cups,” she added. Hartley has just less than two months left to prepare for the Sprint World Championships, which are to be staged in Dartmouth, Canada from August 12 to 16. Good luck for Marathon Champs Mich and Bridg! All the best for the weekend. Give it beans Miss M!